Foxhunting, which for many is the most exhilarating equestrian pursuit, first came to North America with the English settlers. Colonel Robert Brooke, who settled with his family in what is now Maryland, brought his hounds with him from Great Britain in 1650 and is generally accredited with having the first hunt pack in North America. As the Colonies grew, so did the sport of Fox Hunting. In 1840 Thomas, Sixth Lord Fairfax, of northern Virginia, was the first to organize and maintain a hunt for the benefit of a group of fox hunters. The Montreal Hunt, established in 1826 was the first North American Foxhound Club. 14 years later, in 1840 the Piedmont Foxhounds in Virginia, the first U.S. Foxhound Club, was established. Both these clubs are still in existence today. There are records indicating that while the earliest politicians were settling matters of policy, on at least one occasion, matters of state took a back bench when a hunt coursed past The Whitehouse and the politicians interrupted the proceedings to mount their horses and join the chase. Another example of how tremendously fit and courageous hunt horses can be, is the story of Prince Charlie and Captain Jack Jouett of the Virginia Militia. One evening, during The Revolution, while sitting in a tavern, Captain Jouett overheard British plans to ride to Monticello that night and capture Thomas Jefferson, who was then Governor of Virginia. Captain Jouett and Prince Charlie tore across the 60 miles of countryside in the dark, arriving in time to warn Jefferson of the British forces' impending arrival and allowing him time to slip away into the surrounding forests. Although, Prince Charlie would always carry the scars from injuries sustained from falls while jumping obstacles in the dark that night, his courage and top conditioning as a hunter, probably changed the course of American history. There are more recognized Fox Hunting Clubs in Virginia than in any other state. The Masters of Foxhounds Association of America, the governing body of foxhunting in North America, currently lists 177 member clubs in the U.S. and Canada, some of which have been hunting for over 150 years. In addition to laying down rules of behavior for hunters, the M.F.H.A. seeks to ensure that all the animals involved, hounds, horses and foxes, are properly handled and protected. To this end they have developed a Code of Hunting Practices which must be adhered to by all their member clubs. train the young foxes to evade the hounds. Some clubs prefer "drag" hunting, where there is no live quarry and the pack follows the scent previously laid down by the hunt staff who drag a scented bag across the hunt area. This type of "hunting" ensures that the course is suitable for the experience and skill level of the riders following. One of the most recognized traditions of Foxhunting is the attire - the scarlet coat, light colored pants, tall black boots and black hats. While much of the hunt attire is now in large part very traditional it has all evolved from practicality and not just fashion. The scarlet hunt coats are called "Pinks". Why? No one really knows for sure. Some say they are named for the tailor who first designed them - Mr. Pink or was it Mr. Pinque? Others say the term "pink" refered to the faded color of a scarlet jacket after it had been worn for a season or two. Whatever the reason for the name, the most likely reason for using that bright scarlet color, was to ensure the riders were not mistaken for prey and shot as they chased their quarry through the woods. Traditionally, only the hunt staff may wear Pinks, unless a rider has earned the right to do so and the Master of the Foxhunt gives permission. "The Field", the riders following the hounds, traditionally wear black jackets, with their buff or tan riding britches, black boots and white shirts. Some North American hunts allow gentlemen in the field to also wear pinks, and a few of the more liberal hunts will allow ladies to wear them on occasion. The tight fitting britches reduce the chance of getting caught up in branches and the tall boots protect the riders' legs from scrapes. The stock tie, traditionally fastened with a gold safety pin, was designed to double as a bandage for rider, horse or hound in case of an emergency. Riders always wear hats. Very formal attire calls for black top hats, but the most used head gear is the traditional rounded safety hat. "Hilltoppers", who may be slower, less experienced riders not participating in the actual hunt or spectators following the hunt in cars, are expected to be properly turned out but do not follow the hunt dress code. Many supporters of foxhunting here give of their time, energies and financial resources to further the sport but do not actually participate in hunting themselves. For many of the members of the Foxhunting Clubs, the social aspects are a big part of the sport. Hunt Breakfasts (which don't always take place at breakfast time), Hunt Balls, Point To Points, Tailgate Parties are all part of the social side of Foxhunting in Virginia. Non-riders are often welcome at these social events. The controversy over Foxhunting as a blood sport is not a new one. Originally, hunts were organized by farmers and landowners to cull the over population of foxes and deer that were damaging their livestock and crops. In these cases, the goal of the hunt was, and in some cases in Europe, still is, to kill the quarry. Proponents in England consider hunting as a means to effectively control over population of the species as it is the weak, old or diseased animals that are culled. In addition, hunting with hounds is a more selective means of killing than shooting is, which often only injures the animal and leaves it to die a long and difficult death. If the animal survives the shooting, it is often maimed and at a disadvantage with regards to hunting and surviving attacks by other predators. In North America, where coyotes and bobcats are also hunted on horseback, the goal of the hunt is rarely to kill the animal. Quarry that is treed or goes to earth is considered "accounted for" and may not be forced to jump out of the tree or be dug out of its earth in order to continue the hunt. In the rare case that an animal is to be killed, it is done so quickly and humanely by the hunt staff. The species used as quarry are themselves accomplished hunters and as such are worthy opponents in the game of cat and mouse. While no one can know what a fox is thinking, there have been reports of foxes stopping to hunt, doubling back on the hounds, or running back and forth past its own earth, all while being chased by the hounds. While still considered a "blood sport", the manner in which foxhunting in North America is carried out does have certain differences to the traditional hunts in England and Europe. Foxhunters as a group and individually, demonstrate a deep appreciation for the environment they use for hunting activities and respect for all other users, particularly the wildlife, which are seen as opponents in a game rather than as candidates for extinction. 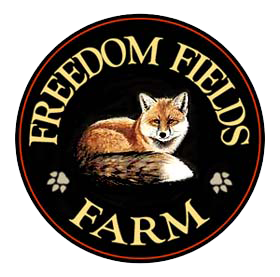 Visit the Freedom Fields Farm website for a list of some of the local area fox hunts and links to their websites. Many of these clubs welcome visiting riders who would like to cap with them or to join in with the Hilltoppers. If you are not a Virginia hunter, it would be a good idea to check with the Field Secretary of your chosen Fox Hunt about local regulations or traditions you may not be familiar with. Freedom Fields Farm offers inexpensive, well-appointed accommodations for your horse right in the heart of Virginia's Hunt Country. Contact us for more information and rates. We also have some beautiful hunt horses available for sale and hunt horses to hire if you are not traveling with your horse. Masters of Foxhounds Association of America The governing body for Foxhound and Foxhunting Clubs in North America. Foxhunting in Ol' Virginny An excellent online resource, written in a light-hearted, tongue in cheek style. The author, Doug Morris, is himself an ardent hunter. Janet Hitchen Photography Beautiful images by a Virginia photographer/horsewoman. International Museum of the Horse More information about "The Hunt"
Chronicle Of The Horse Cooky McClung's description of the requirements of a good Hunt Breakfast is definetely worth a read. Is the U.S. safe from the Foxhunting debate? A National Geographic article discussing some of the Pros and Cons of the Foxhunting controversy with links to other resources. The Sunday Times - A great day for animals? You must be joking More about the controversy. Is it a battle for morality and animal rights or a class war?